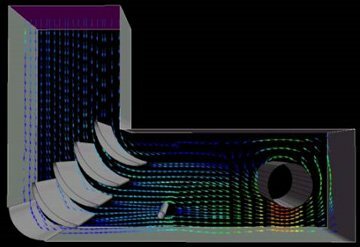 CFD Wind dispersion studies of exhaust fumes. Heat management analysis from enclosed generators. Warranty studies involving diesel intake temperature. This figure demonstrates the capability of our software to evaluate very complex geometries. The diesel engine is located in the basement of a building where the requirement for temperature uniformity was critical. 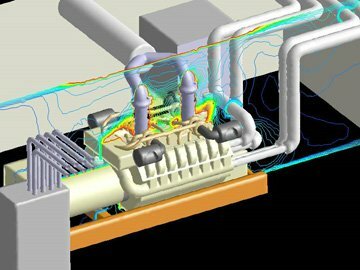 CFD was used to calculate the room temperatures resulting from both convection and radiation as a function of the engine operation. The analysis was also used to identify potential improvements to the ventilation of the room.